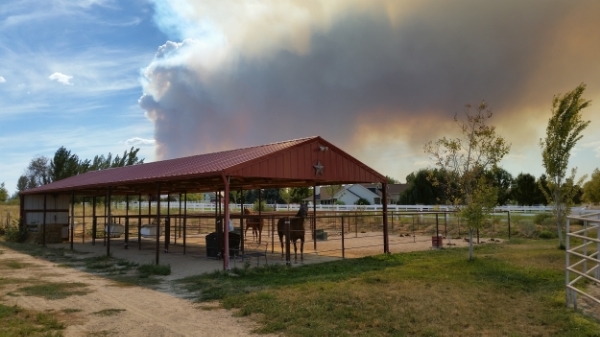 A majority of horse and livestock owners live in rural areas near ecosystems that are fire adaptive or dependent; it is often up to them to figure out how to be properly prepared in the event of a wildfire, and how to best manage their property to reduce the risk of damage. Even if you are not directly threatened by wildfires, summer heat, along with drought, wind and the naturally combustible nature of farm buildings make it wise to take measures to protect your animals and property from any type of fire threat. Learn ways to protect yourself, your horses and your property while living safely near a fire adaptive area. If evacuation is not possible, put all your horses in a fire resistant area, one that has a green vegetative, gravel or dirt buffer around it if possible. Remove any synthetics from the horses that might melt, such as nylon halters, sheets and fly masks. Green vegetation is not as combustible as dry pastures and trees; the larger buffer you maintain, the better the chances the fire may skip over areas of your farm. A vegetative buffer doesn't have to be vegetation. A graveled area, retaining walls, pavement or paver stones can help surround the barn with non-combustible materials. If a vegetative buffer is not possible, keep combustible materials to a minimum: keep grasses mowed short, leaves and debris picked up around buildings, and have an evacuation plan in place that is ready to implement when the fire threat is imminent. If it's possible to maintain a fire pond, you can hook up a booster pump that is wired to a back-up generator, so high pressure water is available when needed. During fire events, many power utilities cut power early as a safety precaution. Find out from your fire department or local emergency personnel the phone number or emergency station to listen to in event of a fire and keep the number posted in the barn and in your phone so you can monitor when to evacuate. During high fire season, keep your trailer ready with everything you might need for a quick evacuation, and have a plan on where you can take your livestock. Full size posters of: Firewise for Horse Owners are available for purchase. CONTACT Alayne for details. HOW TO SAFELY EVACUATE HORSES WHEN FIRE IS IMMINENT. Wildfires can quickly become a real threat to rural landowners. It’s easy to think fires only happen to other people, but this kind of thinking can lead to tragic consequences. When horses or livestock are involved, action needs to be taken quickly to save the lives of your animals and reduce property damage. Being proactive is the safest plan. Cómo evacuar con facilidad a los caballos cuando el incendio es inminente. Los incendios forestales pueden convertirse rápidamente en una amenaza real para los propietarios de tierras rurales. Es fácil pensar que los incendios sólo ocurren a otras personas, pero este tipo de pensamiento puede llevar a consecuencias trágicas. Cuando los caballos o el ganado están involucrados, se debe actuar rápido para salvar la vida de los animales y reducir el daño a la propiedad. Ser proactivo es el plan más seguro.